Some documents or reports allow you to control what data is to be displayed by specifying parameter values. To switch to the Preview Parameters panel, click the Parameters button on the right side of the Document Viewer. This panel allows you to specify parameter values before document preview generation is started. 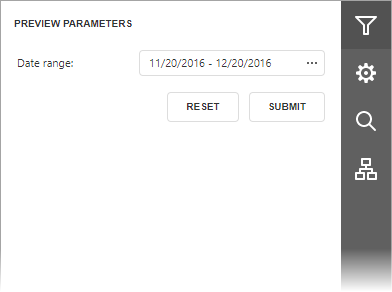 Enter the required values using the corresponding parameter editors and click Submit. After changing the current values, you can revert back the previously selected values by clicking Reset.